Use our Menopause The Musical offer code for a $20 discount on all seats at Harrah’s Cabaret in Las Vegas. That means tickets start at just $40 for the comedy that has been delighting audiences across the world since 2001. Click on your friend Coupon Puppet below to take advantage of this great deal. Then you just have to enter offer code MMC20 in the offer code box. Red Hat ladies unite! Along with anyone else who likes to laugh and watch insanely talented performers sing and dance. Menopause The Musical has officially entered its eleventh year in Las Vegas. That makes it the longest running musical in Las Vegas history! Statistically, it is nearly impossible that all audience members are women going through “the change.” We must conclude that Menopause The Musical and its 60s, 70s and 80s song parodies please theater-goers of all ages and genders. YOU can catch Menopause The Musical Monday through Saturday at 7:30PM at Harrah’s Cabaret, with additional 4:00PM matinees on Saturday and Monday. Harrah’s Cabaret is where the Improv Comedy Club used to be. Just go up the escalator from the Harrah’s casino floor, and you’ll have no problem finding it! 2018 theater-goers are in for a special treat- Cindy Williams of Laverne and Shirley fame is returning as the guest star AKA fifth girlfriend! She is back by popular demand, since she was so amazing in her six-month run last year! Using our Menopause The Musical offer code is easy. Once you get to the Ticketmaster site, select your desired date and showtime (remember, no show on Sundays!). Then enter code MMC20 in the offer code box and voila! You’ll watch the prices magically reduce. 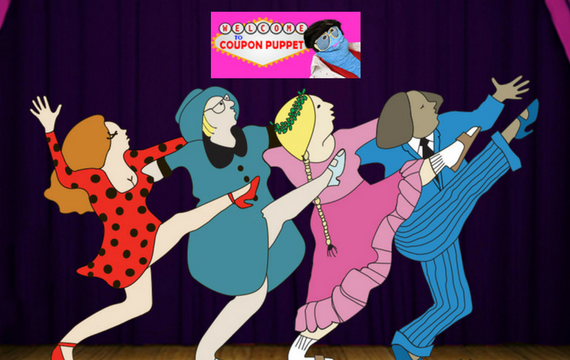 Coupon Puppet Loves Finding You A Great Menopause The Musical Offer Code! Why not catch another show in the Harrah’s neighborhood? Check out BAZ at the Palazzo or Terry Fator across the street at the Mirage!